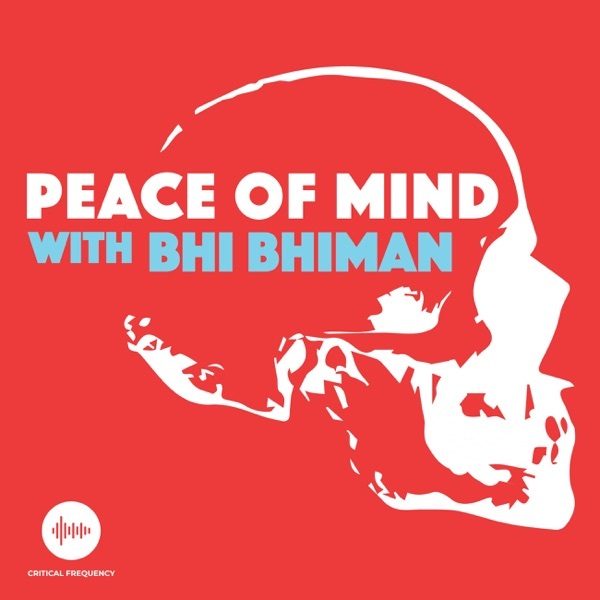 In a nod to the protest albums of the 1960s and 70s, Bhi Bhiman’s Peace of Mind finds inspiration in the chaos that is modern American life. So much so that he had to release the album as a podcast and dig deeper on everything from immigration to religion, racism to Russia with experts, activists and artists like author Dave Eggers, religious scholar Reza Aslan, attorney & advocate Rabia Chaudry, LaDoris Cordell, and more. Part politics, part Behind the Music, all fascinating, Peace of Mind is an album and a podcast for our time. In the final episode of Peace of Mind, Bhi shares a very personal story about how suicide has touched his life in recent years. Peace of Mind presents a special episode of the hit podcast Switched on Pop featuring Bhi as the guest. Switched on Pop is about the making and meaning of popular music; hosted by musicologist Nate Sloan and songwriter Charlie Harding, produced by Vox. They break down pop songs to figure out what makes a hit and what is its place in culture. And they help listeners find "a-ha" moments in the music. In this episode, Bhi joins to explain the “nerd punk rock” behind releasing Peace of Mind as a podcast. And they'll take a deep dive into the song "Beyond the Border". Subscribe to Switched on Pop here. Gender inequality and gender politics. The song for this episode is “GIANT” and it was inspired by the millions of women who are often unsung and overlooked. Our guests include Dr. Nimmi Gowrinathan, author and journalist Amy Westervelt, and we’ll also hear a very personal story from one of our past guests about a female GIANT in his life. This episode is a showcase for some of the lawyers who are pushing back on the Trump Administration in courts everyday -- like Jonathan E. Taylor who helped bring the emoluments cases against Trump. We'll also hear more from retired judge LaDoris Cordell who shares her own story and a chance encounter that lead her to the law. The song for this episode is a cover of Warren Zevon’s “Lawyers Guns & Money”. Ep. 5 Have a Little Faith! What roles do religion and faith play in how Americans live their lives? From the discrimination people face because of their religion to the optimism that faith can bring, we explore it all in this episode. Our guests are religious scholar Reza Aslan, attorney, advocate and podcaster Rabia Chaudry (of Serial, Undisclosed and The 45th), and author Dave Eggers. The song for this episode is “Have a Little Faith!”. Immigration policy and its human consequences. We’ll discuss the differences between immigrants, refugees, asylum seekers, and migrants, and how these groups are often treated as criminals. Our guests are Ahilan Arulanantham (attorney, ACLU Immigrants' Rights Project and Macarthur Fellow), Paola Mendoza (activist, artist and author), and Todd Schulte (President, FWD.US). The song for this episode is “Beyond the Border” stream it everywhere: https://fanlink.to/border. The multi-pronged attack on voting in America. While there are threats from outside countries, like Russia and China, the greatest danger comes from within — from politicians and lawmakers who pervert the voting process to suit their agenda through gerrymandering, voter ID laws, and intimidation. Our guests are Dale Ho (Director, ACLU Voting Rights Project) and Taz Ahmed (18 Million Rising, and host of #GoodMuslimBadMuslim podcast). The song for this episode is “Eenie Meenie”. Democracy – the places where it thrives, the places where it dies. And what’s at stake when any one of the 4 pillars of democracy are threatened. Our guests are investigative journalist and Frontline producer Neil Docherty, retired superior court judge LaDoris Cordell and journalist Salem Solomon (Voice of America’s Africa division). The song for this episode is “Can’t Nobody Stop Us”. Ep. 1 Brother, Can You Spare Some Peace of Mind? A sneak peek of the new album and podcast from popular indie musician Bhi Bhiman, featuring Dave Eggers, Reza Aslan, Rabia Chaudry, and more.